Polex Environmental Engineering has recently installed a turn-key dust collection system at PCA Furniture located in Corrimal, NSW. Due to the fine timber dust generated from several woodworking machines a dust extraction system was required. Polex designed, supplied and installed a Modular Shaker Bag dust collection system with 4000 m³/h airflow capacity, 20 m² filter area and an 11 kW centrifugal fan. The waste is discharged into a 3 m² collection bin positioned under the dust collector. The dust collection system was designed and sized to extract through two machines that operate at the same time. The provision for additional capacity was a key consideration in the design of the dust collection system. The unique modular design of the Polex dust collector enables another filter module to be added without major modifications to the existing extraction equipment. 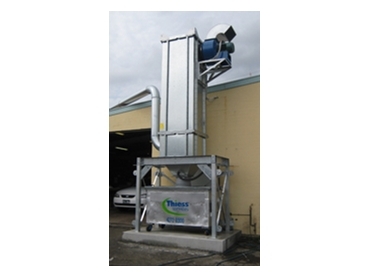 Polex Modular Shaker dust collectors are manufactured from folded and bolted 1.5 mm thick Galvanised sheetmetal panels. The material thickness of the dust collector panels has been optimised to reduce cost without compromising on strength. Polex dust collectors have been designed with smooth internal surfaces to reduce dust hang-up inside the filter chamber and hopper. The dust collector legs are fabricated from heavy Square Hollow Section (SHS) steel as standard, which makes them particularly suited to heavy duty industrial sites and applications. The dust collector legs are hot dip Galvanised for long lasting corrosion protection. All Polex dust collectors are structurally certified to withstand high wind loadings.